The Worlds Smallest National League? You may ask what is the smallest National Football League? Well, the Pitcairn Islands (population 67) does not have a league, and neither does Vatican City (the smallest state by area  although in this case the 770 ‘citizens’ all have citizenship only for the period of their assignment to the Vatican, and resume their original nationality when returning home). I am sure someone will come up with Clerical Cup and other Vatican competitions, but this is not a national league. In terms of area, Monaco is the second smallest behind Vatican on the World lists, with less than a square mile. There are quite a few countries with lesser population than Monaco, including San Marino (and Gibraltar if you wish to count it) in Europe, but at 35,000, Monaco claims less than a quarter of the population of the smallest London Borough (I’ve excluded the City of London itself). Monaco is curious in football terms. On one hand there is AS Monaco, playing in the French League with use of Stade Louis II within the principality itself, but then there is the local league without a ground within the state, and hence playing on two venues in France. The two are at Moneghetti and Capd’ail. Both the grounds are right up against the border of Monaco, with Cap d’Ail being just across the road from the Arches at one end of the Stade Louis II, while wayward shots at Moneghetti must seriously risk entering Monaco. I was on a five day weekend, mainly at the wife’s behest, and so a visit to the Monaco league was not to be my only match of the weekend. A pure footballing weekend in these parts would be a good idea, there are some matches on Friday night, games at various times around the Saturday, the local leagues (from Level 6 down) play mainly Sunday afternoons, and AS Monaco play on Monday, (as well as the Monaco League competition). I was limited however. It was sightseeing during the day, no matter that it rained near continually during the trip, and while I had the evening’s available, the only potential Saturday match would be a revisit to Nice, which I gave away. So it meant that only Friday and Monday evenings would include football. A strange weekend if ever I had one. 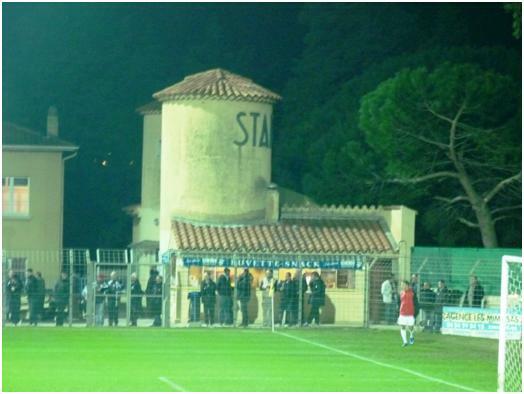 The Friday night match was at Etoile FC Frejus-St. Raphael, in the French National League (which for the uninitiated is their National Third Division). I have never understood the Raison d’etre of the French National League, and yet there appears to be no move to rationalise it. Covering the whole Country, with a lot of Friday night games, the league has to be fully professional, yet the average crowd this season is given as 1655, with a quarter of the clubs managing less than 600 spectators on average. Even these figures may be exaggerated  after the game I saw, the home web site estimated the crowd at 1000, while the visitors said 900, (tickets are sold, so an accurate figure is possible). My own guess is that the Martigues estimate is on the low side. The club itself is a recent merger of clubs in the two neighbouring towns. As EFC Frejus, they won promotion to this level in 2009, and in their merged form they have kept their status. 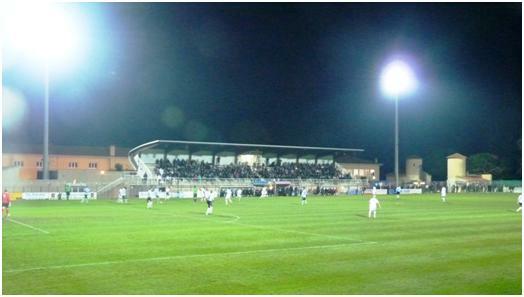 They play at the Stade Eugene Porcin in Frejus. The first thing one says about this stadium is that it is French. At least (from the spectators point of view) it is trackless, with the viewing areas square to the pitch. It has the almost standard cantilever stand along one side. The opposite side and behind one goal is lined with some quite highly stepped concrete terracing, looking as if it has been recently installed and renovated. Probably to mark the 2009 promotion and merger. The one unique point is two traditionally styled towers by the entrance, containing the ticket booths, one of which backs onto a refreshment stall. As far the game, well the lower divisions have a reputation for dull football, and this match fitted well with the reputation. I think the home goalkeeper may have made two saves during the game. His opposite number made none at all. If he had made one save, then the game would have ended scoreless, instead of 1-0 to Etoile. The goal was a well taken turn and shoot by Matthieu Scarpelli. It was scored just less before the hour mark, and only minutes after his side dropped to ten men after Delcos was sent off. And so on to Monaco. I did a little research on Monaco’s major football team, and the relative status of the rest. AS Monaco is of course the principality’s only side in the French system. They play fully as a French team and are indeed affiliated to the French Football Federation. 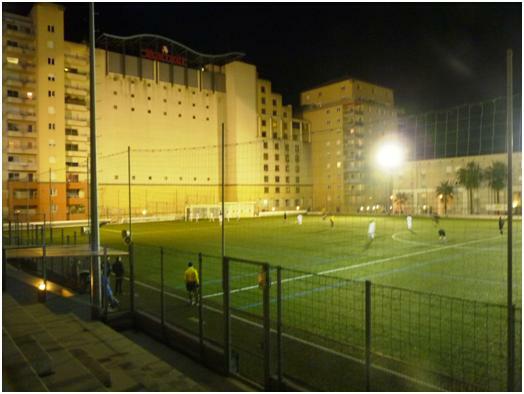 While first team games are played at the Stade Louis II, they have a total of four adult teams and no less than 13 youth teams. Apart from the first team, all the others play their home matches over the borders in France. AS Monaco seconds play in the CFA (level 4) in Menton, while the third team play at Moneghetti and the fourths at Cap d’Ail in the district competition, Ligue Cote d’Azur. The top division of the District League also includes US Cap d’Ail, who play in the top division of the Ligue Cote d’Azur, (level 8 of the French system). Monaco’s teams play at levels 9 and 11. 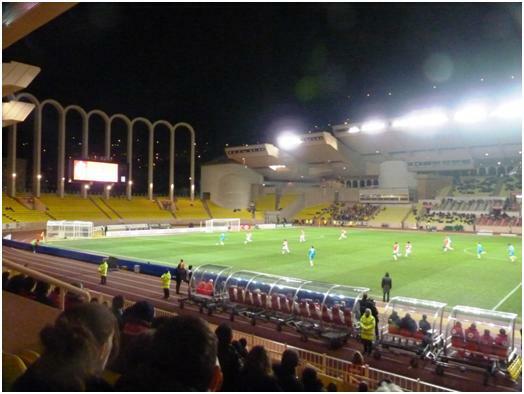 Apparently, the Stadium in Menton is used by two French teams as well as Monaco II, with the highest one also in the regional leagues (Level 7 of the system). The Federation Monagasque de Football organises two football competitions, added to by a number of seven-a-side competitions. There may be women’s and youth football as well, but it does not get a mention on the web site. The competitions are the Challenge Prince Rainier III and the Challenge Ville de Monaco. These are not referred to as national football competitions within, but as Football d’Enterprise, (Football for Companies). All the teams in the league are Monaco companies, or other places of work (such as La Poste or Hopital de Monaco). When I asked about the matches at the stadium, and referred to the league as a national league, I was similarly corrected. Most of the players actually work for the companies concerned, as they are only allowed a limited number of outsiders. Apart from being one of these guest players, it appears there is no competition in Monaco for local players who are not employed by Enterprises with competition membership, and hence the only avenue for their football ambitions is across the border in France, (or of course, AS Monaco themselves). The rules allow for a maximum of five who do not work directly for the company concerned, but no more than 3 in any one category, the categories being “assimilated”, for direct family members of employees, “waivers” for players not connected with a company or “other business” for players connected with a company indirectly  which could include seasonal workers when not working, or contractors from outside. All of these categories can only play for one team if they do not work for another company with a team, so there is no room here for a transfer market. The stadium at Moneghetti. 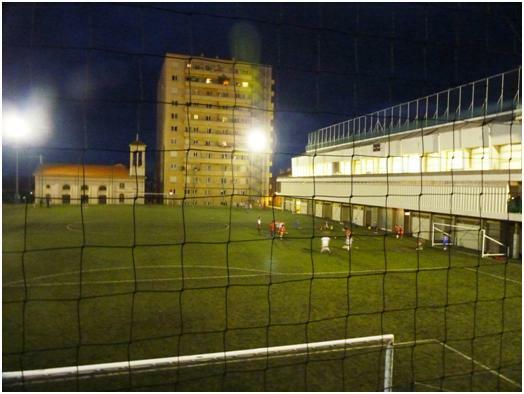 The stadium is in France, but the apartment block and church behind the goal are in Monaco. The only clear spectator areas is at the near end of the building along the side, and a small area (used for parking of bikes) from where I took the photo. There is international competition, Monaco regular enters a team in the EFSA (European Federation for Company Sport) tournament, a biennial competition. Monaco are staging the competition 21-23 June this year. Monaco also enter teams in competition against other non FIFA nations such as Vatican City or Gibraltar. There are some other differences to games in England, but which I have seen in French Amateur Football, either at CFA or regional level. Firstly, the points structure, four for a win, two for a draw and one for a defeat (which means you only get a zero for forfeiting the game, or if you are found to be at fault for an abandonment), and secondly rolling substitutions. The number of substitutes is not limited, and players substituted can return to the field of play, except during the final ten minutes of the game, (a player who has not been on the field of play can still enter late, but a replaced player cannot come back). But the differences go beyond this; this is the only league I have watched, where the rules specify games are limited to 40 minutes each way. The reason for this appears to be time constraints, allowing two matches to go ahead on the same pitch in an evening. Although on the day I watched, (and this is not uncommon), there were two matches at one ground and one at the other, all matches are short. This at least maintains the same conditions in all games. Finally, although my game was too clean to require it, there is a “sin bin”. A player receiving a yellow card is removed from the play for a period of five minutes. A second offence will still result in a sending off, and I assume more serious offences can lead to direct dismissal. The competition is in two divisions, the Challenge Prince Rainier III is the top division with ten teams playing nine games each in the regular season, while the Challenge Ville de Monaco has two groups of six teams, playing only five games in a regular season which is already complete. Both have some sort of knock out at the end, with the two finals played back to back  the only two Monaco games to be played in Stade Louis II. There is promotion and relegation, both of last seasons Ville de Monaco finals are in the Prince Rainier III this season. Cap d’Ail. 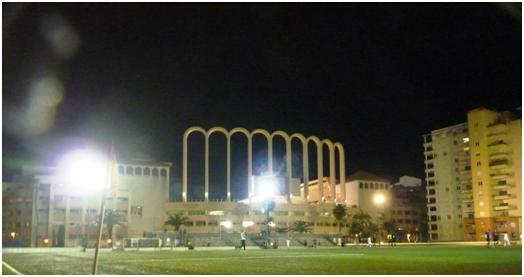 In common with the Stade Louis II next door, this stadium sits above a car park. In this case it is used for the Marriott hotel next door. My groundhopping has always taken on strict rules, especially when watching more than one game in a day, or other over circumstances where part of a match is missed. Basically, when I make plans, I must allow myself the chance to see every minute played in a game, and then if something goes wrong, and poor traffic conditions or a delayed train mean I miss a small portion of the game (how small is not defined), then I will still count the match. When travelling between matches, it must be physically possible to see the end of game 1, and the start of game 2 before I can consider it. I was tempted by the idea of seeing the 18.45 kick off at Moneghetti, and the 20.15 at Cap d’Ail, but despite the fact I may be able to do the distance in under ten minutes (if I did not get lost), this still would not be enough and parking at both locations is a problem. So in the end I went to the early kick of at Cap d’Ail, pausing at the other ground just briefly (I was double parked, the only way I could stop close by  but I was in a row of double parked vehicles). Not surprisingly, with the use they get, both grounds have artificial surfaces. The ground at Cap D’Ail is caged, except that there are a few steps of terracing on one side, with (closed) areas which could be used to sell refreshments. The number of spectators varied slightly during the game, but generally, I counted them at six (including myself). The game was between SMB administration and SMA. The company SMB (Société des Bains de Mer), which also features another team in the division, (SMB slots) runs some of the best known casinos and hotels in Monaco. SMA is Société Monégasque d’Assainissement, which sounds better than its English translation the Monaco Sanitation Company. Incidentally, until SMA was founded in 1938 as a separate company, sanitation was the responsibility of SMB. The idea being that they were given a monopoly on running the casinos, but they also took responsibility for garbage as part of the deal. Cap d’Ail looking towards Monaco. The game was as poor as any match I have seen this season. Whereas I managed to mark down the starting XIs into 4-2-3-1 formations, neither side really kept their shape well. What was clear was that SMB Administration (second in the league at the start of the evening, and destined to go top for a week until the leaders played again), were by far the better of the two sides. 3-0 up before SMA scored with a rare shot in the 15th minute, SMB extended the lead to 5-1 at the break and 11-1 at the end of the game. Such high scoring is not entirely typical  the average goals per match in the league is around 6, and the only other double figure haul was when league leaders Ribeiro Freres defeated bottom placed SMB Slots by 10-0. Before the game, I found the one league official in the ground, and he allowed me to copy the players names off the official list. I know they are correct as before kick off, the referee called each player out from the list, and checked the numbers were correct. This rigmarole, a minute’s silence before kick-off, and a full ten minute break at half time meant we were running late. I actually left the ground at half time, crossed the road (and national border) to Stade Louis II, bought a ticket for the second division game there and returned to Cap d’Ail. I did not run, but still completed this in four minutes flat. At the time, I thought my game could run on to about 8.25, but in fact the referee compensated for the late start, by shortening the second half. It was a decision I thought odd, considering we had a ten minute break and three minutes injury time in the first half. Somehow, I suspect the locals take a pragmatic view. All that could have happened in a longer game was that SMB would increase their dominance to more than the 10 goal margin seen. No doubt I will get some stick from the purists for including a game that barely exceeded 70 minutes, and had uneven lengths of halves. Frankly, I admit that even if this was to be seen as an extra game, it lacks something. As the supposedly major game of my evening, (as the other was no less than my third visit to the stadium). As a ground that I am claiming as a tick, it only just gets to pass muster  I did after all see the whole game, and the score counts. As mentioned earlier, I ran across the border at half time and bought a ticket for the game at Stade Louis II  which gives away the fact I did not stay for the second of the evening’s games at Cap d’Ail. It was a wise choice, for the second division game was full of entertainment and interest. The arches as views from inside the Stade Louis II. I have a good past record watching Monaco, having seen them seven times, including twice at home and with the team winning five and drawing twice on my watch. However, they are well in the past, being based mainly on time I had to visit the South of France while working, and all seven previous visits came while Arsene Wegner was in charge of the team. One of the victories I had seen Monaco record, was on my visit to Racing Club de Lens. That was of course when both teams were doing well in the top division, now both are in division 2, and Monaco appear to be at risk of dropping lower. Lens are known for actually having support, even for away matches  a rarity in France where distances are much greater than in England, and where games are much less likely to be scheduled with the convenience of the fan in mind. (Consider how much the convenience of the fans is taken into account in arranging televised games in England, and then think what less consideration must be like). Still there were around 100 visitors in on corner of the ground waving the colours, Sang et Or (Blood and Gold). The team actually played in a greenish hue of blue, with just a small amount of bright lime green trim. These are not colours that could invoke pride, so it is no wonder that only the traditional strips are on show. Monaco played in the familiar diagonal red and white halves. The first half contained plenty of chances at both ends, but no goals, Monaco had looked better earlier in the game, and started the second period strongly as well. This time they got it right, scoring quickly, and then adding a second. Two nil up ten minutes into the second half, and cruise control sets in. Meanwhile, with no improvement in the situation, Racing Club bring on the youngster Thorgan Hazard. Thorgan’s elder brother, Eden is expected to move to the Premier League in the summer with clubs such as Arsenal and Chelsea chasing his signature. Assuming he is a better player than his brother, I can well understand this. Thorgan changed the climate of the game from the moment he took the field, and crossed the ball for Toudic to pull a goal back within two minutes. Toudic then missed the most open of a number of chances that went astray as Lens attempted to level the game. The game went into injury time with Monaco still ahead, but three minutes later, Lens finally got the equaliser. Some Monaco fans may well think they were robbed of points that would have lifted them out of the relegation zone, but this would be to misrepresent the game. Lens should have scored their second much earlier, based on the dominance they held in the closing stages, and the chances created. This entry was posted on Monday, February 27th, 2012 at 10:42 pm and is filed under The European Game. You can follow any responses to this entry through the RSS 2.0 feed. Both comments and pings are currently closed.